Dan Wilson (center) of GLMV Architecture was presented the Champion Employer Engagement Initiative Award by KBOR and Butler. The Kansas Board of Regents (KBOR) and Butler Community College partnered this month to recognize GLMV Architecture as part of KBOR’s Employer Engagement Initiative. The Employer Engagement Initiative is focused on connecting businesses with education. KBOR recognizes three levels of participation with Champion being the most engaged and supportive which includes providing internship opportunities for students or faculty, and taking a formal supporting role of education. GLMV and Wilson were recognized for their outstanding commitment to education and employment of Butler students. 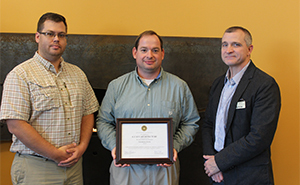 This week, Wilson, project manager for GLMV, was presented the Champion Level award by Mel Whiteside, Dean of Butler’s Science Technology, Engineering and Math Division, and Daniel Higdon, Engineering Technology department chair. The Engineering Technology Program is housed in the college’s 5000 Building in Andover.